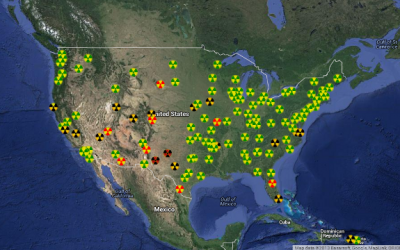 Here is a real-time map of radiation levels within the U.S. SOLVING FUKUSHIMA …. Geology fish farmer UTUBE in Pacific Rim.. see it. We are a dying planet, at the hands of humans. This administration is quick to send money and arms to alqaeda and others such as Libya and Egypt. Why are they blindsighted not sending help to Japan to control this serious problem? This tragedy is far worse than any war or troubled areas in the world. The global elite did a job on the Gulf of Mexico destroying our fishing industry and food supply in that region with the oil spill that is predicted to produce serious illness in the years to come.. 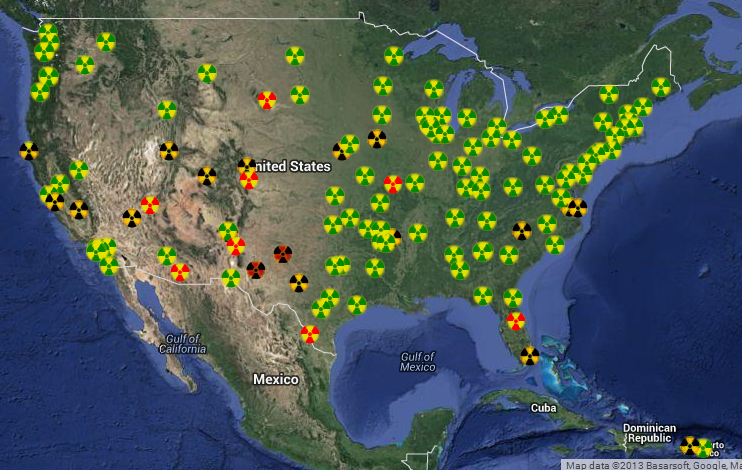 This radiation will deplete our food supply on the West Coast. What do you think they are planning for the rest of the country? The Tribulation will be man made and is on the way. Pray that Our Lord intervenes and stops the plotting behind closed doors that will harm the people of this world. Repent and be ready. Come, Lord Jesus Come. Preserve this world, YOUR CREATION! Sometimes i believe that the whole “natural” movement is no more than a gimmick to create sales for commercial interest that want to become the new walmarts of the world, the new “Mc Natul”! Cheate fear, which gets as many as pssible to spend larger sums of money for “certified” organic non gmo products so that the natural health and food economy’s will get rich and fat just like those that exsist now. I believe you and other sites similiar in function as to what good you provide, should continue to offer up good information as to what is out there and proven to work to combat radiation and all the rest we know of with well written full disclosure article. To many times natural products are talked of and their benifits with little or no information on how to grow/prepare/and use, no recipes of any kind? If your truly concerned with others health, then “Do So!”, if not, then it will be evident to all in time that you and others doing like yourself are really more interested “growing” the natural movement financially than a deep core concern for the health of others. Love reading all your comments and learning. Should we abandon the building of nuclear plants? Should we close all that exist? BTW – where does all the ‘waste’ from these facilities go? Some time ago I posted that California should prepare for the onslaught of radiation from the tragedy in Japan. The water that continues to leak from the damaged plants and the deadly radiation has made eating fish caught in the Pacific Ocean for the coming years a not to eat commodity for this table. Not one news or Government Agency is covering the event or sending any scientific expedition to the middle of the Pacific Ocean to investigate the radiation levels. We will need the coverage soon, but we have no policy for getting anything done, and after two years of the ocean spreading these particles someone needs to knock on the door. I see that Japan says all is OK, and we are agreeing, but when will we learn the truth. This is a personal message to Greenpeace USA and what your doctrine has meant to me for as long as I can remember, now I need your help. Since the earthquake and tsunami-damaged Japan’s nuclear plants and with the radiation spreading over this past two years and our Government seems not concerned, and takes Japan’s word that all is “A OK”. What would it take with all the Russian problems that you’re having to do a study for America? The logic behind it is overwhelming, from the drop & cover in the early days to Three Mile Island, Chernobyl, the SL-1 Accident, and now Fukushima Daiichi which worries us. I can muster thousands of supporters hoping that you can see the ramifications, not as a political statement, but as a supporter of world events. Please don’t be condescending, we need answers. Japanese robots are unable to tell when to protect national image and when truth must be told. The ability to discern has not been programmed into the brain of the robots or have been lost. Much has to change to the Japanese psyche. Should we all pack up and head off into a self contained spaceship? As much as i dont like Gbear This article in particular didnt provide alot of evidence or facts with the number of problems they cite. I was mostly disappointed with this article, and even though he believes 9/11 was an act of war controlled by terrorists in afghanistan Im on his side about the lack of credible relevance. Wow – there’s hope for you yet! As for 9/11; I doubt we’ll ever know the full truth, so there’s really no point in speculating about it. GO TO: RadiationNetwork Dot Comm. They have an interactive map that updates every 5 minutes as to the radion exposure locations and threat levels, throughout the entire USA. Put this Web Link on your smart phone as well for easy access while you are Mobile. He shrugged his shoulders because he didn’t know… of all the gazillions of causes of the fluctuation in salmon prices he wasn’t sure. But you are, apparently. It’s gotta be FUKASHIMA! Wow… thanks for enlightening us. I reiterate, our leaders have allowed a compound, enriched, to be manufactured in huge amounts which cannot be eliminated nor destroyed. It is invisible. It can affect you and your family and decedents for hundreds of years.Imagine sparklers going off all around you and that is the result of radioactive material in your neighborhood, in your water in your back yard, and with dust on your feet, inside your home. Not only is it invisible but it doesnt stop a few feet out like a sparkler. It will penetrate anything for miles and miles, and it will linger and produce these life altering effects for hundreds of years. We are in deep trouble folks. And if you agree more nuclear plants should be built, you are an insane person. All the banter is worth the read. Journalism is an art and a science. Art is creativity, an absolute genius. To be thoughtful about intelligence and the way one uses Words To Emphasize a point is down to an exact science. This article, and every comment, was able to reach multitudes of people. Radiation is real, and its harmful, and completely toxic. Scientifically speaking, or rationally speaking, would anyone really open a can of Tuna if there was a big radioactive warning label on it? American culture is geared towards fear. We are built on the concept of freedom, however it is amazing how caged most Americans feel. They read the newspapers and all the signs, and still some people are blind to the “bigger picture”. In other words, think of those in need first. Countless people are working on this cleanup and are risking their lives everyday to try and revert a world so warped. We MUST salute them. Those people risk their lives everyday, so that our children and our children’s children can live out a fulfilling and healthy natural life. We are entitled to know what poisons are in our foods, and our water. United we must stand on this issue. Locally, regionally and globally. Individuals, please take personal responsibility for individual choices. And let us all be a little more environmentally conscious. Treat others as we would like to be treated. In solidarity, Sister Hail Mary. Journalism is a responsibility first. The journalist has a responsibility to research the facts and apply reasoning – COGENT reasoning – to the facts and communicate to others. Not this article! We fail in this country miserably – fail to learn to LEARN and THINK. Being rational and logical is not prized in our schools or our families. Most people don’t even understand what the nature of radiation is… let alone why it is bad. Let’s start with education and truth. So when you insult me by liking a comment that is defamatory, I should insult you. Is this correct? IF FISH CAUGHT IN CALIFORNIA ARE TAINTED!! WHAT ABOUT THE REST OF THE OCEAN? THERE ARE BILLIONS OF PEOPLE THAT DEPEND ON THAT OCEAN FOR FOOD AND WORK!! YOU ARE NOT JUST TALKING ABOUT CALIFORNIA!! YOU ARE TALKING ABOUT WHOLE COUNTRIES, SOUTHERN ISLANDS SOUTH AMERICA COAST, MEXICAN COAST, AUSTRALIA, NEW ZEALAND, PHILIPPINES, CHINA COAST KOREA’S COAST, ALL OF JAPAN, ALASKA & CANADA!! TALK ABOUT A DEPOPULATION OF THE WORLD!! The greatest danger from Fukushima could come as a result of the extremely dangerous (but necessary) Reactor 4 fuel rod removal (from the spent fuel pool) beginning now. In part because I live five minutes by bicycle from the California coast, I am also very concerned about Fukushima. Whether one agrees with gdbear65 or not, the puerile attacks on his character sabotage a reasonable discussion. Radiation stays in the environment for thousands of years, it will take years to see the consequences on life…. and it does lower immune systems….thyroid disease, cancers, tumors, birth defects, mutations, large populations of smaller creatures dying of disease… not scare mongering, it’s already been researched and proven the effects of radiation on the environment. The amount of radiation Fukishima has released and continues to release is unprecedented, could change the evolution of life on this planet. Damn – I stopped reading xhert’s post after the first sentence, so I missed that hilarious statement! Along with Chernobyl, nuclear tests on the Marshall islands released many times more radiation into the environment than Fukushima. Why is there not a Facebook link for this important article??? It was posted on Natural Society’s FB page… that’s how I found it. Why can I not share this on the internet??????? Ok, did that… sorry. It is worth sharing to everyone!!!!!!!! No it’s not worth sharing – it is highly inflammatory and rife with inaccuracies, the equivalent of gossip. You’re doing your friends and family a disservice by spreading this false information. Try doing some of your own research – read articles on both sides – you’ll see that the people who spread this misinformation are ignorant of the science and the facts. Two of the “8 Signs” above (items 2 & 3) don’t even attempt to make any link to Fukushima (read the actual articles referenced). Yet somehow the author of this article has the clairvoyance of zero scientific evidence to make that intellectual leap. “F..K THE US WEST COAST”!! THE PACIFIC OCEAN IS SHAPED LIKE A GIANT FISH BOWL! THE CURRENTS TAKE THE WATER AROUND TO WHERE IT STARTED!! ALL THE COUNTRIES TOUCHING THAT OCEAN IS AFFECTED!! IF IT DILUTES FINE, ACCEPT FOR THE FISH THAT SWIM IN IT!! BUT IF IT DOES NOT DILUTE, AND CONTINUES ON ITS MERRY WAY!! THEN THERE ARE MANY,MANY,MANY MORE PEOPLE INVOLVED, THAN THE WEST COAST OF THE US!! The way I see it, the author’s likely intention with this brief outline is to get people thinking; or start working on their own investigations to delve way deeper. Further, although not mentioned by the author or responders, all should be aware that TEPCO began their painstaking decommissioning or removal of dangerous fuel rods from damaged Nuclear Reactor Unit 4 just this past week (Nov 18). As Dr. Mark Sircus explains, this is like working with a seriously crumpled pack of cigarettes while trying to lift each fuel rod out at a time…without allowing it to be exposed to air, bang against another rod or be dropped…because any of these calamities could set off the worst firestorm of nuclear reaction the world has ever seen, like with 89 times more radiation than was spewed from Chernobyl. Skeptics and those responsibly curious need to visit: http://www.ENEnews.com and fukuleaks.org to view the text and photos of what was posted Nov 18, 2013. As the TEPCO press release states by end of that first day: “Fukushima, Japan, Nov 18, 2013-TEPCO announced today that they have completed the first day work for fuel removal from the Unit 4 spent fuel pool at Fukushima Daiichi NPS. Four fuel assemblies were loaded into the cask, and all the work for the day completed at 6:45 PM. ” Then, be sure to read the many other concerns about this man-made (faulty design by GE, decades of political ignorance, greed) disaster-in-the-making that is frankly recognized by many of us as THE apocalyptic threat of all time. For what it’s worth, there are natural nutrients/supplements that can be used to metabolically detox both ingestion and breathing in of radioactive isotopes so this too, is an important investigation to embark on in order to better protect yourselves and loved ones over whatever the course of time. By egregiously willful crimes of the few, we, the human race, will have much to atone for…if fair Mother Earth does end up being permanently poisoned (thousands of years) by this particularly dreadful chain of events. yeah that’s it, discredit the person who points out the truth. I suppose you believe the moon landings were faked and that 9/11 was all a big conspiracy within the US gov’t. The moon landings were fake and 9/11 was a conspiracy within Israel and The U.S. Government. Not sure about the moon landings, but anyone who still believes the cockamamie USA government 911 conspiracy theory hasn’t been paying attention, and is increasingly in the minority; for those people, I suggest a visit to ‘[2000+] Architects & Engineers for 911 Truth ( http://www.ae911truth.org/ ). LOL 9/11 wasn’t carried out by Bin Laden the whole story that was told was full of lies and deceipt from the american government. I find it hard to imagine that people still believe with full heart that 9/11 is how George Bush said, and that it has full filled the needs of the powerful to corrupt the truth and tighten the grasp of the public. Its not coincidence ad its not a conspiracy. The North American public as a whole are so busy and pre-occupied with everything from kids, work, the need for consumption, greed, lust, and just laziness to see that were being pushed through, in essence, a slaughter house like cattle. Remember the Reichstag fire ?…. nothing like letting some facts get in the way of a good scare-mongering – try doing some actual research on the subject and you’ll see your source for this article is ignorant of the science and other factors at play. I’m disgusted that you would reprint such drivel. 300 tons of water is 1/8 the amount needed to fill an Olympic swimming pool and even if radiation levels are 95% higher than reported, they are still well below the safe-limit established by the EPA. The fish to which the Vancouver Sun refers was caught in the waters off Fukushima, which have since been closed to fishing. Seal pups are dying from a scarcity of food and salmon populations have been declining for years. “300 tons of water is 1/8 the amount needed to fill an Olympic swimming pool…” You missed that part that said EVERY DAY. Smudge on your glasses? No I saw it, but if you read the article I cited you’ll realize that it’s not as bad as people seem to think. Most of it dissipates almost immediately in the ocean currents near Fukushima. It is cause for concern but no reason to panic. Articles such as this one overstate the dangers and don’t provide relevant facts. All they do is incite people to get upset over issues that are out of their control. Even if all the warnings are true, which they’re not, what can you do about it? Radiation does not “dissipate”. Just as corexit did not make the oil from the BP Gulf oil spill “disapeer”. How much money do you get paid to infiltrate web site comment sections, and spread evil? LOL! you’re too funny. Yes I’m so evil I refuse to believe unsubstantiated claims based on cherry-picked data. Ok so dissipate is the wrong word – I should have used diluted. I was wrong. Happy now? Did you bother to read the article I cited? On this issue I happen to trust the science more than irrational fear-mongers. The problems with the environment and ocean ecology started long before Fukushima. Scientists have been warning us about global warming since 1934! We’re seeing an accumulation of human effects on the natural world, not just the small chapter of sordid history Fukushima represents. shows that you are not as smart as you wish to appear. Do you believe everything the science for profit industry feeds you? Would you rather get into a swimming pool 10 days after I added a gallon of radioactive waste, or the Pacific Ocean? Naturally, it would be much safer to swim in the ocean after 10 days. Of course the waste product (that CARRIES the radiation) dilutes. Stop insulting people directly and maintain a healthy debate about issues. now let’s employ all those critical thinking skills, shall we? Buessler and other experts say this much is clear: Both short-lived radioactive elements, such as iodine-131, and longer-lived elements — such as cesium-137, with a half-life of 30 years — can be absorbed by phytoplankton, zooplankton, kelp, and other marine life and then be transmitted up the food chain, to fish, marine mammals, and humans. Other radioactive elements — including plutonium, which has been detected outside the Fukushima plant — also pose a threat to marine life. How the radioactive materials released from the Fukushima plants will behave in the ocean will depend on their chemical properties and reactivity, explained Ted Poston, a ecotoxicologist with the Pacific Northwest National Laboratory, a U.S. government facility in Richland, Washington. If the radionuclides are in soluble form, they will behave differently than if they are absorbed into particles, said Poston. Soluble iodine, for example, will disperse rather rapidly. But if a radionuclide reacts with other molecules or gets deposited on existing particulates — bits of minerals, for example — they can be suspended in the water or, if larger, may drop to the sea floor. According to your simplistic analogy, it seems you are suggesting that the Pacific is too big to fail. Perhaps you need to abandon the New World Order mentality, before it fails you. Well that’s the spirit! At least you’re trying to substantiate your claims – more than the author of this pathetic article did. But, of course, you and others who get ‘angry’ at others for demanding REASONING have to resort to insults and personal attacks (e.g. “simplistic analogy”, etc,…) I in no way have, in any of my posts, suggested that the Fukashima incident wouldn’t or couldn’t lead to ecological or health problems – and I personally am 100% opposed to nuclear power in the first place. Surprised? Still, there is currently no evidence to support 95% of this article’s claims. And for the record, I didn’t present an analogy – I argued that the radioactive waste/spillage would dilute/dissipate – and it will. Whether or not that turns out to be adequate – we’ll see. Read the article. Carefully. The key characteristic of pychopaths is their inability to feel emotion. There is a time and place for legitimate expression of emotion. Awareness that 300 tons of radiation is spilling into the Pacific Ocean on a daily basis, while our international leaders continue to downplay the danger, is an appropriate time for expressing anger. I do hope you are aware there is a very real threat from the Great Pacific garbage patch.The plastics caught in the gyre slowly break down until they are tiny enough to be eaten by small fish and work their way up the food chain. I don’t think the danger is being downplayed. Have you read anything of the Marshall Island nuclear bomb tests? Then you know that many times greater radioactivity was released into the atmosphere and absorbed by the ocean, than what has been released by Fukushima. As I posted earlier, Fukishima is to ocean acidification, as the Keystone XL pipeline is to carbon emissions, inferring that there is a point of toxic poisoning that nature reaches, which causes a general collapse of systems. Fukushima is a bellweather event, and should serve to awaken all humans to the catastrophic direction in which our species is headed. Perhaps the title of this article was a bit kitschy, but the great masses seem to respond to kitsch. I believe the author is attempting to wake up the masses to the growing problem of pollution in our oceans. Peace to you, and all who care about our oceans. Thank you and the same to you. We are on the same side here. I just think the alarmist reaction is not a good strategy. We need more scientific evidence in order to convince people in positions of power to take action. We also need people to bring solutions. The environment is under threat from so many sources it is overwhelming. I just hope it is not, as David Suzuki seems to think, a lost cause. We have come into being on a precarious planet, and seem blindly intent on becoming radioactive ourselves. It would seem that producing radiation is the preferred activity whenever material entities gather in large numbers. Half the matter in the universe is in the stars, in a continuing state of nuclear reaction, and the other half is scattered like dust in space.Perhaps it is inevitible that we humans will destroy ourselves and that Nietzche was correct: hope is our greatest sorrow. Thanks for the debate. It is possible for people to disagree passionately, without resorting to cruelty. Agreed! I’m angry too. But publishing baseless articles that mislead people doesn’t help the cause. Responsible, coherent journalism is a powerful tool and this ridiculous article is counterproductive. Alienating reasonable people by spouting irrational drivel will not be a catalyst for change or action – it just makes those who publish it (and follow it) look stupid and distract from the reality and gravity of the situations. Unless you wrote the article, you need not take offense. You sound paranoid. I’m not smart, though I am intelligent – if I were smart I wouldn’t waste my time on the likes of you. Paranoia is justified, when the object of your fear is real. Moonlight; This Fukushima fubar is a mess, but your bigotry is what’s really scary, and very sad. Radiation absolutely dissapates… perhaps a better term would be diluted. To take a given amount of material that is radioactive and dilute it in a massive body of water reduces or eliminates all together the risk – depending on the original amount. I suggest you follow the link gdbear65 provided and read the analysis… it’s about critical thinking and dealing with FACTS… not emotions. There may be very REAL effects and consequences from what’s happened – but the point is (was) that THIS PARTICULAR article is riddled with fallicies and a lack of basic logic. … and so we’ve established that Buessler (et al) believe that some radioactive elements can be absorbed by the bottom of the food chain and up to the larger animals. And therefore, since there was an accident where some of these isotopes were released then it follows that our food supply is ruined, is that it? Or can you quote another expert who can actually quantify the results in terms of how much was released, how much has been detected in samples (compared to before-accident levels) and also determine what the dangerous levels are. I’m nervous (seriously) , but I’m not going to run around writing articles and making claims like this article makes without acquiring the facts to substantiate those claims. This is the point. Actually the article is an amalgram of story headlines from the past few weeks. It seems you are more intent on discrediting the author as fearmongering, than researching the material gathered for the article. Could your desire to prove you are correct be hampering your ability to address your own anxiety and fear concerning this disaster? Simple concepts allude you apparently. I am saying only one thing. This article is not a good or credible piece of journalism. I’ve worked as a reporter and newspaper editor – no editor would allow something as ridiculous as this to go to print. There is NO substantiation for the “facts” presented in the article. I have no access to the material gathered for the article – I don’t know the author. I am capable, however, of cogent reasoning and the article has numerous examples of the opposite – fallacious reasoning. If that upsets you – sorry. ” Even if all the warnings are true, which they’re not, what can you do about it?” Are you suggesting that we all go to sleep and allow our species, indeed all species, to allow the big science for profit industry funded by big banks to destroy us all? No, I’m asking you – what can you do about it? We’re all concerned about this issue but other than a lot of hand-wringing and nail-biting there’s not much to be done, except to see how it plays out. Fear-mongering does not help anyone. For one thing, you could join your local environmental groups, for another, you could learn the names of your elected officials and write to them of your concerns. You could stay in touch with the latest news from various sources concerning the Fukushima disaster and make attempts to educate yourself and your community. .
and you’ve done all that? How about an FB page? your EPA raises the “acceptable level “everytime some man-made ecological disaster occurs …lol !! !